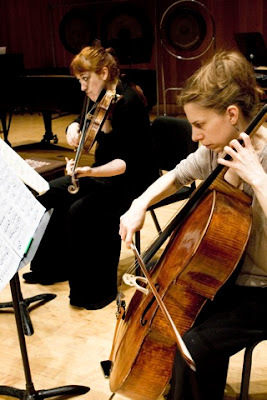 Since its foundation in 2006, the Center has functioned as a key pillar of support for European new music ensembles touring in the US through its visiting artist series and annual June in Buffalo Festival. 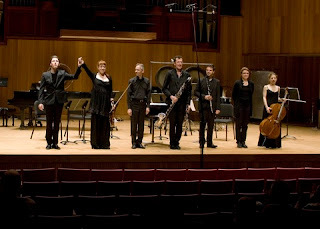 During its twelve years of existence, the Center has created an extensive network of partnerships, with Arts Council Norway, Central Arts Council (Finland), Embassy of France in the United States, FACE (French-American Contemporary Music), Swedish Arts Council, the University of Pittsburgh, and others. This has resulted in a formidable lineup of visiting artists, with many of the most in-demand European new music ensembles conducting residencies at the Center: ensembles Surplus (2010), Linea (2011, 2013, 2016, 2017), Court-Circuit (2011, 2013, 2014, 2018), Interface (2012), Norrbotten NEO (2012, 2014), Son (2013), Uusinta (2016), Cikada (2017), and the Arditti String Quartet (2007, 2010, 2014, 2016, 2017). In the near future, this programming will continue in the form of Ensemble Court-Circuit’s residency at the Center in April. The Ensemble will conduct a workshop with the Center’s graduate composers on April 16 (to be discussed in a future blog post) and give a concert of works by established French and American composers. The ensemble’s activities in Buffalo are part of a larger US tour including visits to NYC (Roulette), Massachusetts (Le Laboratoire, Cambridge & Clark University), and Pittsburgh (Music on the Edge/University of Pittsburgh/Andy Warhol Museum); the touring program includes Center artistic director David Felder’s partial [dist]res[s]toration, as well as works by Sean Shepherd, Christophe Bertrand, Philippe Hurel, Philippe Leroux, John Aylward (world premiere), Helmut Lachenmann, and Ludwig von Beethoven. The tour is supported by l’Institut Français, part of the Office of Exports and Cultural Services of the Embassy of France in the United States, and the East Coast Contemporary Ensemble, who will play alongside Court-Circuit at the concerts in NYC and Massachusetts. Ensemble Court-Circuit’s concert at the Center for 21st Century Music is on April 17 at 7:30 in Slee Hall. For details about tickets, visit Slee Hall’s website.